Butterfly Bush, Buddleia davidii, has been widely bashed from garden writers, ecologists, and conservationists. Attacked from all sides by master gardeners and other garden professionals, I am sticking to my guns on the benefits and pleasures of planting it. “An invasive thug that only provides sugar-water”: That is the complaint that conservationists use to discourage you from planting this shrub. As a preferred late summer nectar source and butterfly magnet, I enthusiastically promote it in my butterfly presentations for its many virtues. An important tool to draw butterflies, I also plant many natives next to it that can act as host plants. One of the few flowering shrubs that deer will not touch, I use it all the time in my landscape designs as an easy to grow, beautiful, fragrant, disease free, flowering shrub. The only care required is a general whacking back of the whole shrub in the early spring to encourage bushiness and flower production. Over 100 varieties provide a wide palette of forms, sizes, and colors, to choose from. The dwarf varieties are especially valuable for small gardens and containers, like ‘Blue Chip’ and ‘Pink Chip’, growing only 4 feet tall. And these are sterile varieties that will not set seed. Why do butterflies love this plant? Providing loads of sugar water , the nectar filled nectaries, are shallow which is important to accommodate the short-tongued butterfly. Butterflies can reach the copious nectar easily which has a high percentage of sucrose, an energy fuel. Attractive to moths, bees, and other insects, this plant is valuable to all kinds of wildlife, not just butterflies. Native to Japan and China, butterflies don’t care where their source of nectar hails from. 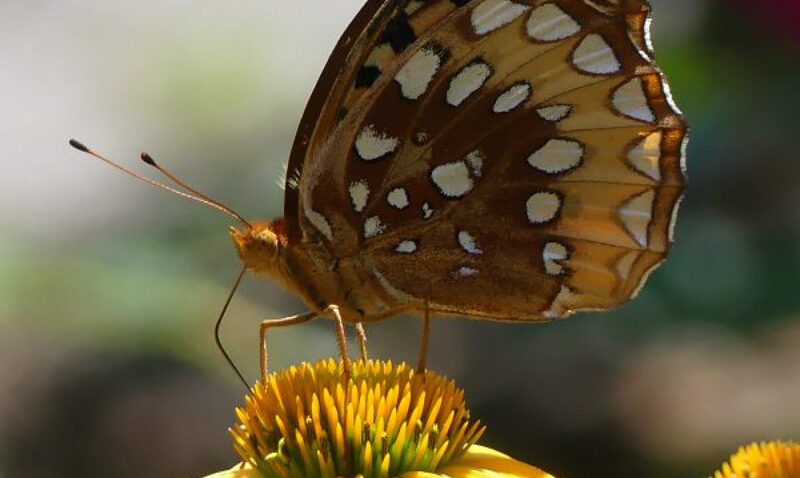 In my post Butterfly Watching, I noted that butterflies have taste receptors on their feet to locate food and if their foot’s receptor and the molecule match, the butterfly eats. So, the plant’s origin is irrelevant and is an attractive food source. As humans, we eat many non-native plants, why can’t a butterfly do the same? Invasive thug or non-native adaptive? There are several ways of looking at this plant. I know that it invades into mostly disturbed areas where lots of aliens/invasives have already taken over and is known as an invasive in over 25 states. But still, it is providing an important late summer source, when it is sorely needed. The other short-coming that ecologists claim is that butterfly bush only provides nectar, not acting as a host plant for the caterpillar to reproduce, but that is also true of other native plants. “Buddleia provides an important nectar source for adult butterflies, moths and other insects in townscapes and the countryside. This has become increasingly relevant because wildflowers have become so depleted following habitat loss and the general lack of nectar sources in the countryside. It also brings enjoyment to many people, both because of its heavy-scented and beautiful blooms but also because of the butterflies and other insects it attracts. It therefore plays a role, alongside other non-native garden plants, in helping to maintain or restore the link between people and native UK wildlife such as butterflies. In gardens, Buddleia is often pruned annually thus removing seed-heads and reducing the potential for seeding. Buddleia is not important as a caterpillar food-plant and cannot replace naturally occurring wildflowers, which are crucial to provide a variety of nectar through the year as well as being food-plants for caterpillars. Buddleia can cause serious problems on some important conservation sites, especially brownfield sites. It needs to be controlled in these and other semi-natural sites to allow natural vegetation to develop. The cost of control can sometimes be considerable. In reaching a position on Buddleia it is important to weigh up the undoubted benefits it brings in garden situations against the possible risks to wildlife habitats. It is also important to recognise that Buddleia is already naturalised and well established across much of the UK. In view of its value as a nectar source, BC will continue to recommend its planting in gardens alongside other butterfly-friendly non-native plants, but will avoid giving it undue prominence and will give advice on its management and control. A sea change is going on with some conservationists, that we are dealing with a changed world and there is no way to go back to an idealized world of stable co-habitating species. From the beginning of time, species have moved around, finding new territories, and creating new ecological niches. Invasive species, like it or not, are part of nature. Serving an ecological purpose, whether it aligns with our idea of what it should look like, isn’t relevant to nature. • Non-native plants can prolong the flowering season providing an additional food source. So, armed with this knowledge, you make the decision. This is so interesting. I live in the US (Michigan) and I only have one Butterfly Bush that is FAR from invasive. In fact, I wish It would spread. The past two years it’s growth has been slow and stunted. Mine is the variety that doesn’t grow from the old wood, but sprouts from the base each year. I have the same experiences you mentioned, and truly enjoy the butterflies that visit. I also had a hummingbird moth visit two summers in a row,which was amazing. It is invasive in southern states, like Virginia. I have seen it lining the roadsides in Virginia. Thanks for commenting. Love the two that grow on front and side of our deck.Far from being a problem,only that we can sit at our corner table in the sun room and enjoy the sights of pretty blooms. many butterflies and bees etc.Thanks for letting me think and know I`m not doing the wrong thing. It is extremely invasive here in the PNW. I don’t have any growing in my garden, and neighbors nearby don’t have any, and yet I get them as weeds. I’ve seen them growing in sidewalk cracks in Seattle and at the side of the highway. Invasiveness depends partly on climate. It sure does. Plants are invasive where the conditions are right for them to spread. Habitat loss is often due to non-native invasive plants. The situation will only intensify as they spread. Like pets, exotic plants need management. If you plant it, cut it back. And do so before winter, when birds will spread the seed, each in a custom made package of fertilizer! Share this excellent post with all your neighbors, all the people in any organization to which you belong. I am constantly surprised by the innocence of non-gardeners about “NNIs”. I don’t care how invasive they are. If I find one, I’m going to plant it and let it spread where ever it wants to go. I love them. I’ve planted several, then had to move away. 🙁 Haven’t found one at the nursery’s here yet. I will though. I love these plants! You can get creative with the color varietals and enjoy butterflies in your garden during peak blooming season. Also, the blooms are so pretty! Thank you for sharing your enthusiasm for these wonderful plants! I have a “Butterfly & Hummingbird Garden) with feeder for both. It contains 3 tri-color (magenta, white and purple butterfly bushes, and 2 rainbow butterfly bushes that were trained young to grow like trees (tall trunk, bushy top). It also has 2 perennial lantana’s, beebalm, and red honeysuckle. The “tree’s” I periodically have to cut off any new growth on the “trunks), but other than that, I cut them back to the trunk, and the bushes almost to ground, same with the lantana, and they have not spread or creeped, and they grow to a manageable size each year, then get cut back again in the fall. My garden is about 10 years old. The bees, butterfly’s and hummingbirds love it. I live on the northern coast of Virginia. I think the key is to take care of your bushes and keep them groomed.